Hughie Fury travels to the Arena Armeec in Sofia, Bulgaria this Saturday to face local favourite Kubrat Pulev (25-1, 13 KOs) in a 12 round IBF title elimination bout. Whoever wins will become the mandatory contender for Anthony Joshua’s IBF strap. Pulev, 37, has been relatively inactive in recent years, with his last bout coming 18 months ago when he defeated Kevin Johnson by unanimous decision. Pulev’s only defeat was in his title challenge against Wladimir Klitschko back in 2014 when he gamely tried to go toe to toe with the champion, succumbing to a 5th round KO. The 24 year old, Fury, has only one defeat also, which came in his title challenge against Joshua Parker for the WBO title in September 2017. Fury gave a good account of himself, showing good movement however he didn’t let his hands go enough costing himself the victory. Fury (21-1, 11 KOs) returned in May this year and took on Sam Sexton for the British title. It appeared Fury had learned a lesson from the Parker defeat as he threw and landed more, winning by TKO in the 5th round. With the prospect of facing Joshua in a massive fight at Wembley next year, Fury said in a press release, “Those are the kind of fights I want and that fight in particular. “I’m not looking past Pulev but whenever that Joshua fight is available, I’d take it with both hands. It’s a case of beating Pulev, getting that out the way and then we’ll talk business after that. “Titles mean a lot more to me than money. I’ve never really been interested in money. I’m focused on one thing and that’s becoming a world champion. “I feel stronger in myself and I’ve got more hunger, drive and motivation to get the job done. I’ve had disappointments in the past but they helped make me the person I am today. In the press conference this week, Fury said,”Thank you to the people of Bulgaria for welcoming me. I’ve had a great reception – it’s a pleasure to be here again. It’s a country that I’ve been coming to since I was a teenager and I hope to come again soon. Pulev said,“This is the first time such a high profile fight has been held in Bulgaria. It’s never happened before. My opponent is very strong and It’s a very serious fight at world level. “Camp has gone well and I’m well prepared. I’m in a concentrated place. I believe my years of experience has led me to this day where I have the maturity to manage fights to the end. I work very hard and this is what I’ve been doing the last three months with my coach and team. I have developed my strength this past year, not just physically but also mentally. I’m in the best shape I can. 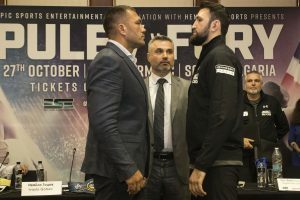 With the fight taking place in Bulgaria, Pulev will be the favourite, Fury may have to try and KO the Bulgarian to have a chance of winning, if it goes to a decision, expect a Pulev win. The fight will be shown on Channel 5 in the UK and ESPN+ in the USA.